the Copenhagen shop that closed in 1992. When Tokyo-based Danish journalist Kent Dahl was two years old his parents gave him a small wooden monkey. The monkey was the work of the famous Danish designer Kay Bojesen. Initially the Danish silversmith had made the monkey and other wooden figures for his son. But as word of the toys spread, demand for them grew. Eventually, they were put into production, made by traditional Danish craftspeople. Bojesen sold them at his silversmith shop in Copenhagen. They became a great success. Kay Bojesen designed his first wooden toys in 1922 and continued to make them up to his death in 1958. Kent’s encounter with the cute monkey prompted him to buy part of the remaining inventory of toys, when Kay Bojesen’s shop closed in 1992. Ever since, they have been kept in pristine condition in Denmark for 25 years. Kent has finally decided to part with most of his collection to let other collectors have the pleasure of owning these fine examples of Danish craftsmanship. from 17 to 26 November 2017. Kay Bojesen passed away in 1958, but his wooden toys remained very popular in Denmark and abroad. They continued to be made by the same traditional Danish craftspeople as before. 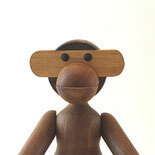 The monkey was made at the carpentry workshop of M. Monsen in Ballerup outside Copenhagen. Most of theother toys were made at Langeskov Trævarefabrik. Bojesen’s wife, Erna, continued to run their silversmith and craft shop in “Bredgade number 47” behind the Royal Palace in Copenhagen. The toys were also available in other shops, among them the furniture and craft shop, E.D. Møbler, owned by Kent’s parents in the city. Erna Bojesen died in 1986 and her children took over the company. The same year, Kent moved to Tokyo to work as a foreign correspondent for a Danish newspaper. The cartoonist at the newspaper, Bjorn Weddum, often illustrated Kent’s back page articles from Tokyo. They struck up a friendship. It turned out that Bjorn’s wife, Annemette, worked in Kay Bojesen shop. When visiting Denmark, Kent and his Japanese wife, Masako, would usually call on Annemette there. They would often buy a few wooden toys for themselves or as presents for their friends around the world; including Japan. When visiting the shop in 1991,however, there was sad news. Kay Bojesen’s children had decided to close the company and the shop. Fearing that this Danish heritage would be lost forever, Kent decided to buy a selection of Kay Bojesen figures as keepsakes. He has since kept them in perfect condition in Denmark. More than 25 years have passed since Kent bought his collection of Kay Bojesen vintage toys in the shop in Bredgade. Now over 60, he feels it is time to let other collectors have the pleasure of owningthese fine examples of Danish craftsmanship. However, Kent will not part with all of his Kay Bojesen figures. He still keeps his old monkey and a selection of other of the Danish heritage figures as reminders of his Danish heritage. Copyright © HOKUONOHONMONODAKE CO.,LTD. All Rights Reserved.